Product description: Pecafil is a flexible and versatile form-working material perfect for those radius specifications that don’t comply with standard form products. 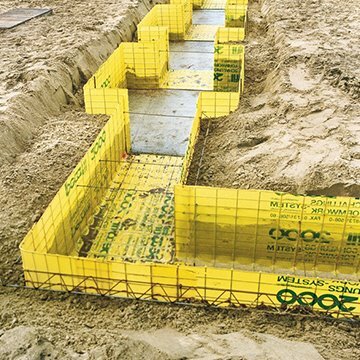 The strength and flexibility of Pecafil makes it the natural choice for a myriad of applications including ground beams, footings and bases, pile caps, construction joints (stop ends), special shapes or curves, void formation, ribbed and waffle slabs, penetrations, recesses, temporary fencing and safety screens. Pecafil is sacrificial. You can just set and forget! Supplied in sheets; featuring flat-sheet wire mesh and a heat-shrunk layer of polyethylene on each side. Easy to install; doesn’t require heavy lifting or tools to construct.